Gas-guzzling cars are gaining favor once again, as low oil prices are cheapening petrol, driving consumers away from more economic and expensive eco-friendly models. Both Brent and West Texas Intermediate crude have fallen below $50 per barrel, greatly cheapening the cost of refined products such as gasoline and petroleum. In the US, gasoline for cars is selling for about $2 per gallon according to the Automobile Association of America (AAA). In Dallas, Texas, a nationwide record was set on Saturday of $1.30 per gallon. Last week oil prices fell to six year lows, with Brent and WTI both dropping below $45 a barrel for the first time since 2009. Consumers in the two biggest markets - China and the US - are reacting to this trend, skipping fuel-efficient vehicles in favor of luxury cars, SUVs, and big trucks. In America there are over 250,000 full electric and plug-in cars, and if sales continue their strong upward trend, that number is set to keep growing. However, the figure is still short of President Barack Obama’s goals of 1 million electric vehicles on the road. The Obama administration also will require automakers to increase fuel efficiency from 35.5 miles per gallon (mpg) in 2016, to 54.5 mpg by 2025. According to the Electric Drive Transportation Association, electric and plug-in cars, combined with hybrids, make up 3.6 percent of the car market. The sales boost was helped by crude oil prices being at a historical high since 2008. In Europe, it’s another story. Unlike other countries, the US doesn’t impose federal taxes on gasoline. In Norway, a gallon of gasoline costs more than $9 dollars, and in Turkey, more than $8. For many European drivers, the investment in buying electric still pays off. 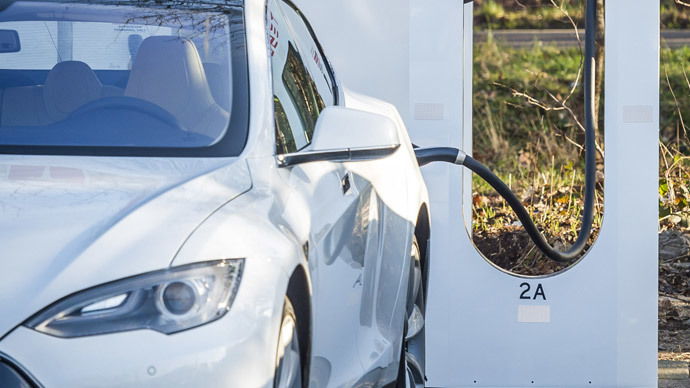 In the US at the current level of $2 gallon gas, someone shopping for an electric car can only expect to make back money the saved in fuel in 14 years, according to Morgan Stanley analyst Adam Jonas. The stock price of Tesla Motors, which exclusively sells plug-in vehicles, have been hit hard by falling oil prices, with shares losing 15 percent in the last six months, currently trading at $193 per share, down from its year high of $224. Solar, wind, and other renewables will likely not face the same fate as electric cars, since petroleum is not used to generate electricity,Adnan Amin, the Director-General of the International Renewable Energy Agency (IRENA), told the FT.
“We don’t see a direct impact of oil prices on power generation,” Amin said. However, he warned that low oil prices could spur low natural gas prices and eventually pose a threat to wind and solar power generators.